Educator and philanthropist; born in Inowrazlaw, in the province of Posen, Prussia, Aug. 14, 1793; died at Berlin, Jan. 22, 1864. He was the founder and life-long director of the Jewish Orphan Asylum, Berlin. Being the son of a poor rabbi, the days of his boyhood were spent in the study of the Talmud and other Jewish literature. In 1817 he went to Berlin, following his elder brother, Dr. 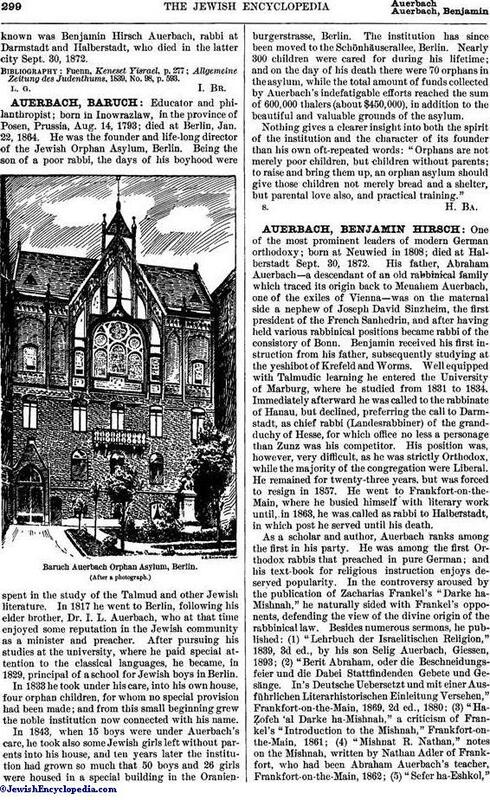 I. L. Auerbach, who at that time enjoyed some reputation in the Jewish community as a minister and preacher. After pursuing his studies at the university, where he paid special attention to the classical languages, he became, in 1829, principal of a school for Jewish boys in Berlin. Baruch Auerbach Orphan Asylum, Berlin. In 1833 he took under his care, into his own house, four orphan children, for whom no special provision had been made; and from this small beginning grew the noble institution now connected with his name. 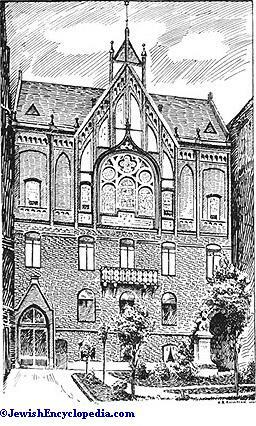 In 1843, when 15 boys were under Auerbach's care, he took also some Jewish girls left without parents into his house, and ten years later the institution had grown so much that 50 boys and 26 girls were housed in a special building in the Oranienburgerstrasse, Berlin. The institution has since been moved to the Schönhäuserallee, Berlin. Nearly 300 children were cared for during his lifetime; and on the day of his death there were 70 orphans in the asylum, while the total amount of funds collected by Auerbach's indefatigable efforts reached the sum of 600,000 thalers (about $450,000), in addition to the beautiful and valuable grounds of the asylum. Nothing gives a clearer insight into both the spirit of the institution and the character of its founder than his own oft-repeated words: "Orphans are not merely poor children, but children without parents; to raise and bring them up, an orphan asylum should give those children not merely bread and a shelter, but parental love also, and practical training."